In 1958 Edgard Varese’s ‘Poème électronique’ premiered at Expo 58, also known as the Brussels World’s Fair, the first major World Fair after World War 2. 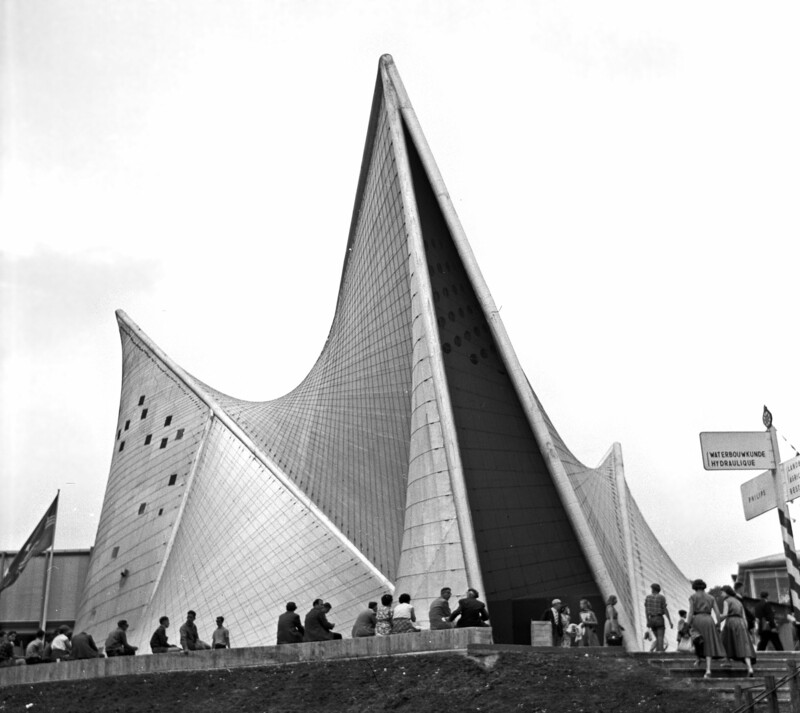 The premiere took place in the extraordinary Philips Pavillion, a cluster of nine hyperbolic paraboloids designed by the office of Le Corbusier and managed by Xenakis. But perhaps even more extraordinary is the nature of the Expo itself, especially in the late 19th and first half of the 20th C.
What is a world fair, a world exposition (or Expo for short)? It is an exhibition designed to educate, share innovation, promote progress and enable understanding between nations and cultures. World Expos have always had at their heart a central aim to help humanity make sense of change and navigate difficult times. Almost every statistic about an Expo is mind-boggling in some way. Expos have been taking place around the world for 160 years at a rate of one approximately every 5 years with the exception of the 2nd world war period. Most of us know something of the very first Expo – The Great Exhibition, which took place in Hyde Park, London in 1851. Joseph Paxton’s 990,000 square foot architectural masterpiece, later called the Crystal Palace, was built to display examples of technology developed in the industrial revolution. Six million people visited. The money raised paid not only for the exhibition itself but there was enough left to fund cultural and educational institutions including the Geological Museum, the Museum of Science and Natural History, the V&A and the Imperial College of Science. By 1958 (the year of Poème électronique) the Expo had developed into a decidedly space-agey affair. Brussels 1958 was dedicated to ‘Progress and Mankind’. It was a turning point in the history of Expos; it marked an 18 year absence from World Fairs following WW2 and whilst still showcasing national prestige, it questioned the unconditional celebration of technology and placed humanity – not technology – at the heart of the event. According to the Expo Museum, a staggering fifty-one million people attended. 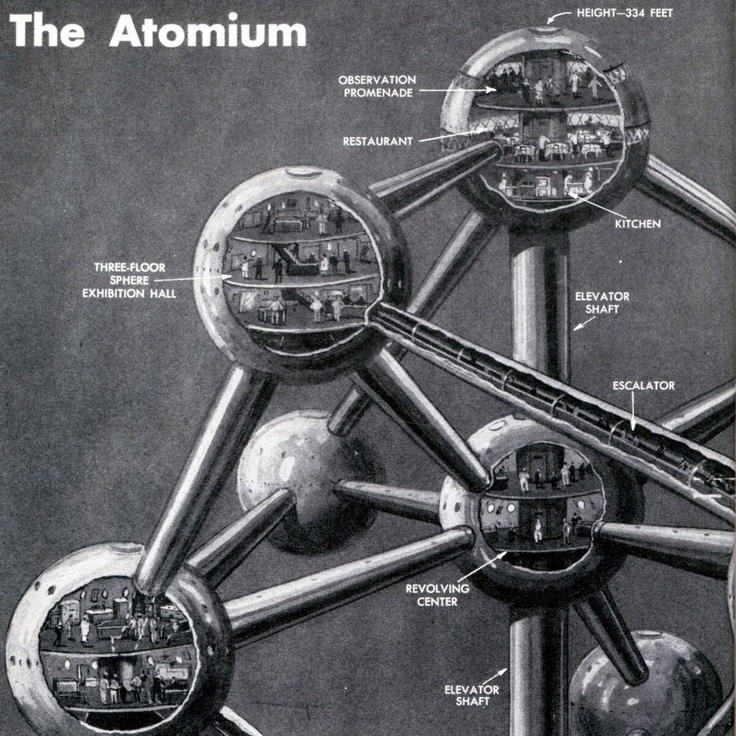 At the heart of the 500 acre site was the Atomium, an iconic ‘seminal totem’ which symbolised the democratic will for peace, faith in progress and an optimistic vision of a better life for mankind. Brussels 58 was perhaps the most ‘improbable postwar event that actually took place’ The July 1957 edition of the UNESCO Courier  offers a fascinating and generous preview of the whole event. There is also a surprisingly good quality home video of the Fair on YouTube in which I experience a little frisson of excitement at 2 minutes 24 – the Philips Pavillion! There it is! Cable cars and futuristic architecture rubbed shoulders with surprisingly ‘classical’ looking statues and paintings. The Dutch pavilion displayed part of a ship. There were tropical gardens and numerous models of landscapes, sometime whole countries. The USSR sent the famous corps de ballet from Moscow and built a Parthenon around a statue of Lenin. The United States sent theatre companies and orchestras. France sent the Comédie-Francaise and I’m pleased to see from the Courier that the ‘leading London symphony orchestras’ were also present. The film shows what appear to be impeccably behaved crowds of smartly dressed people. In truth, the dominant ‘theme’ appears to be one of ‘anything goes’ …but I think that’s the point of the early World Fairs. They inspired flights of futuristic fancy. They were absurd. They got people buzzing, speculating on the future. And it is in this innovative, bold and fantastic context that we can see the true value of experimentation, one of the most significant byproducts of the World Fairs. A perfect setting for Le Corbusier, Xenakis and Varese to create an electronic poem…..next blog post!